To get the most out of your campaign, you can split the sources and try to target your mobile traffic. You might consider plenty of use cases for such targeting. For example, there are more chances to get a conversion on any mobile game on Wi-Fi traffic, while PIN-submits will perform better on the carrier one, especially if you are looking for some specific set of numbers. Having several campaigns on different kinds of traffic might also help you in split-testing your landing pages. In this article, you will learn more about setting up carrier targeting and how to investigate to optimize it. Go to your campaign details: You can either click Edit on an existing campaign or set up a new one. Scroll down to the Traffic Filters section and select the Mobile Only radio button. Click the Show button to display the advanced options. Zeropark Info: If you have selected this option, you have completed the process and can continue with the campaign’s setup as usual. 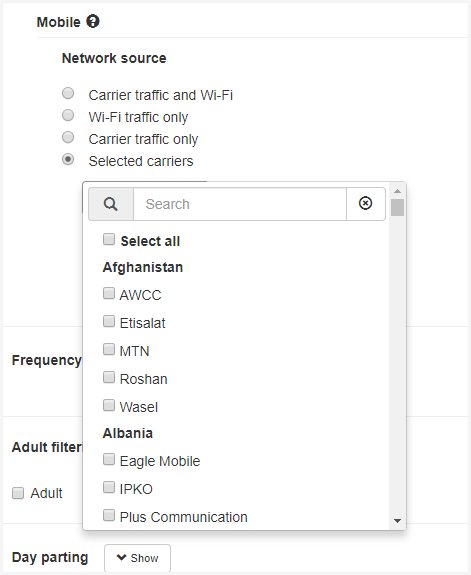 Select the networks you would like to target. When you have made a decision which carriers you want to target, continue with the campaign’s setup as usual.